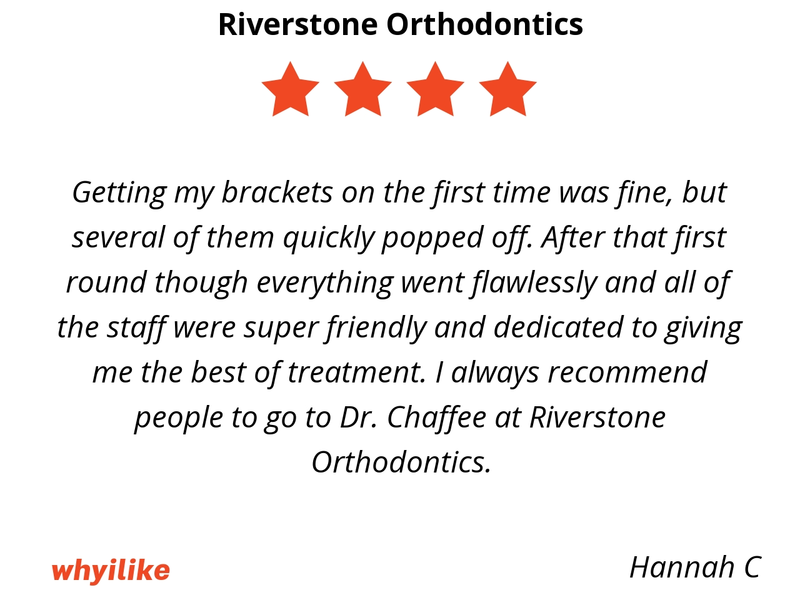 Dr. Chaffee is very knowledgeable and professional while also friendly and personable. His staff is wonderful. We always felt we were in good hands! Everyone at the office was smiley and respectful. It was a pleasant experience with great communication. 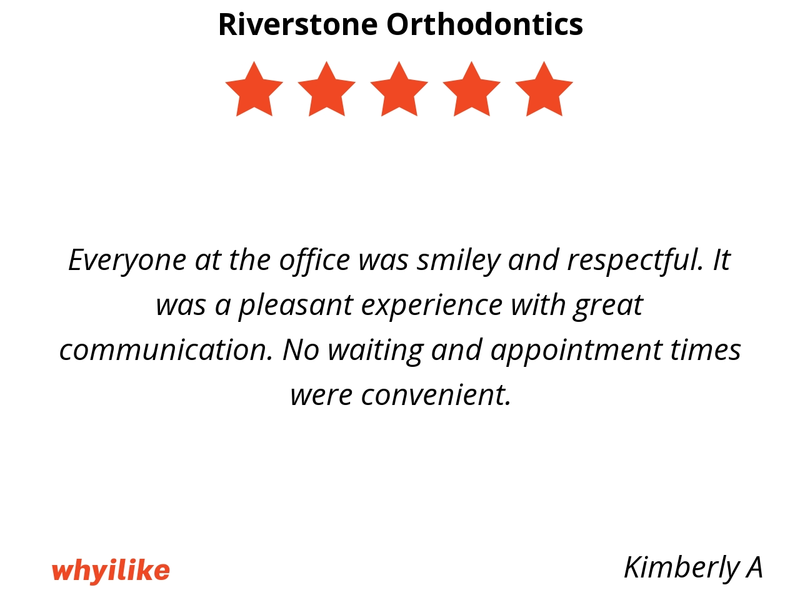 No waiting and appointment times were convenient. 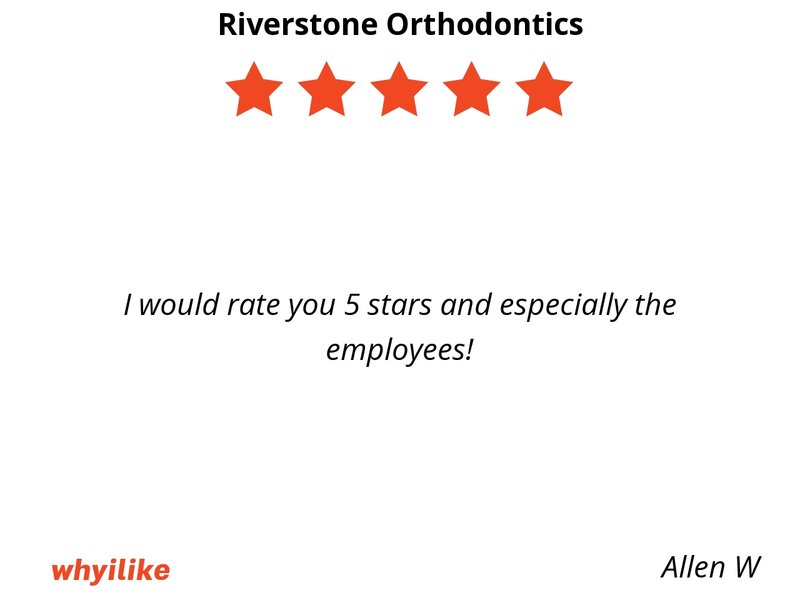 Riverstone Orthodontics provides excellent service and they care about each of their patients. I wouldn’t want to go anywhere else. I feel so much at home. Thank you so much for fixing my smile and making it beautiful. I wouldn’t want to go anywhere else if I had to choose. It has been a long ride “2 years” but it is so worth it. Thank you! Love you guys. 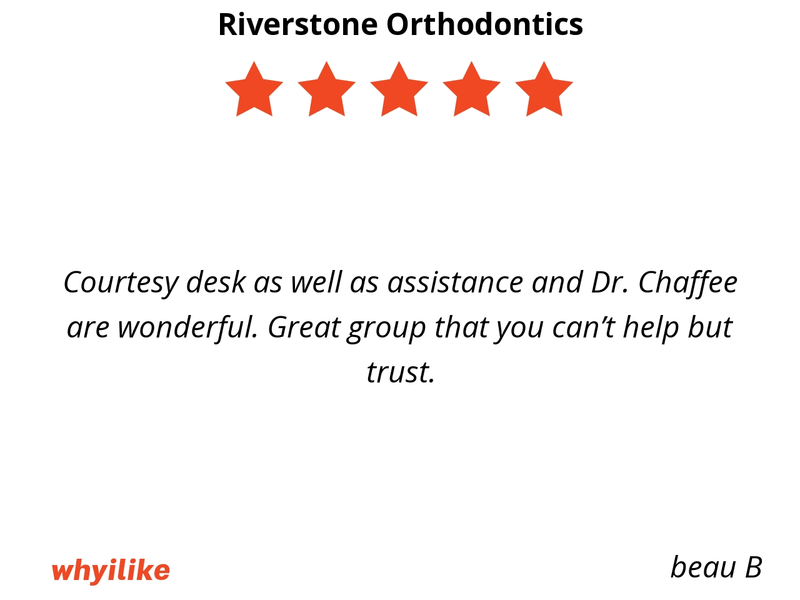 Courtesy desk as well as assistance and Dr. Chaffee are wonderful. Great group that you can’t help but trust. 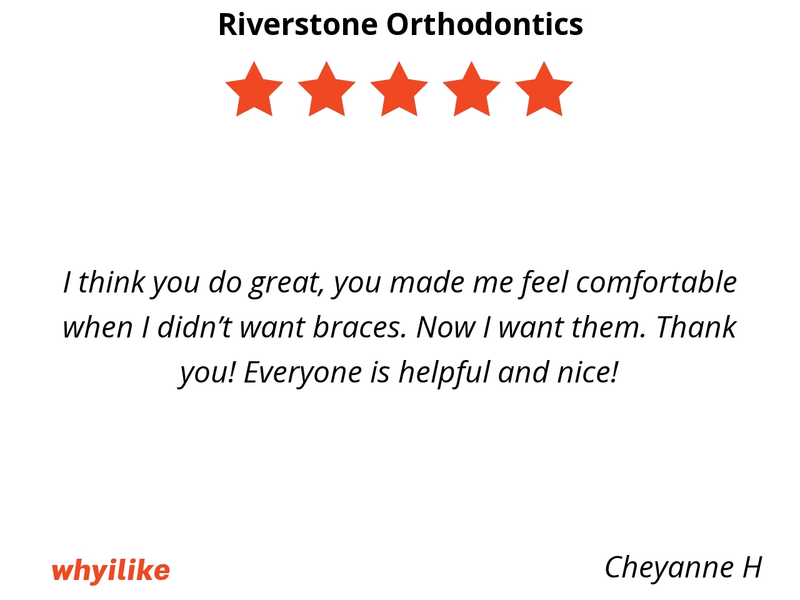 I think you do great, you made me feel comfortable when I didn’t want braces. Now I want them. Thank you! Everyone is helpful and nice! Everyone that works here is so competent and genuine. 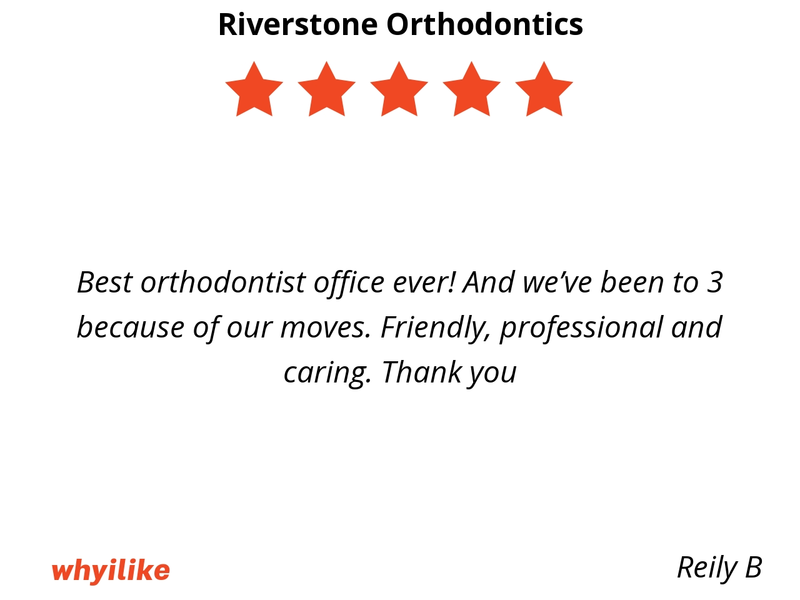 It’s wonderful to be in good hands from the front desk to the doctor…and everyone in between. It show that you all love what you do! 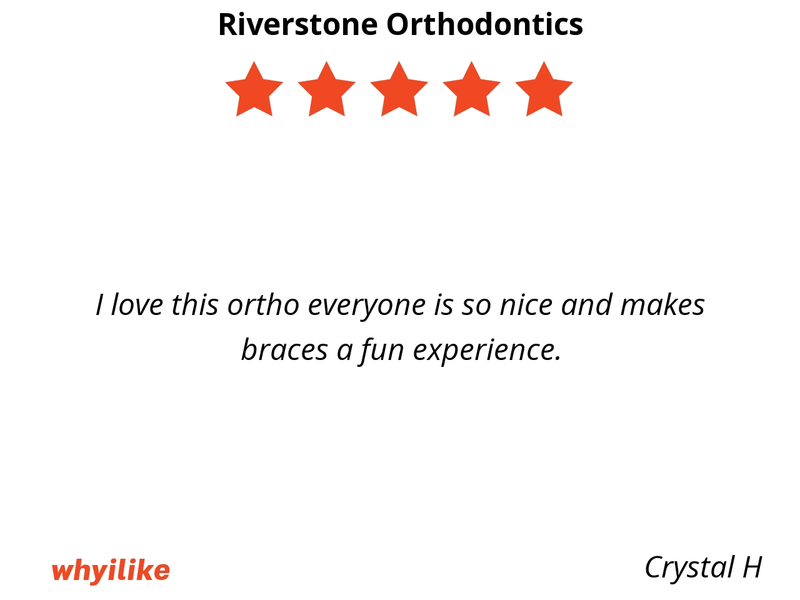 I love this ortho everyone is so nice and makes braces a fun experience. I never feel scared when I am coming here. 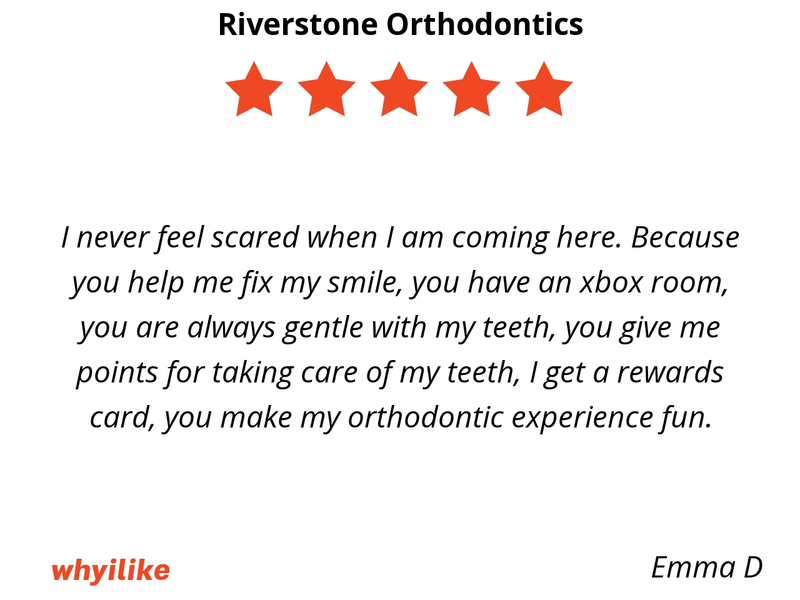 Because you help me fix my smile, you have an xbox room, you are always gentle with my teeth, you give me points for taking care of my teeth, I get a rewards card, you make my orthodontic experience fun. I would rate you 5 stars and especially the employees! In a world where great customer service is becoming hard to find, you all work above and beyond to accommodate. Thank you for your exceptionalism in your field. 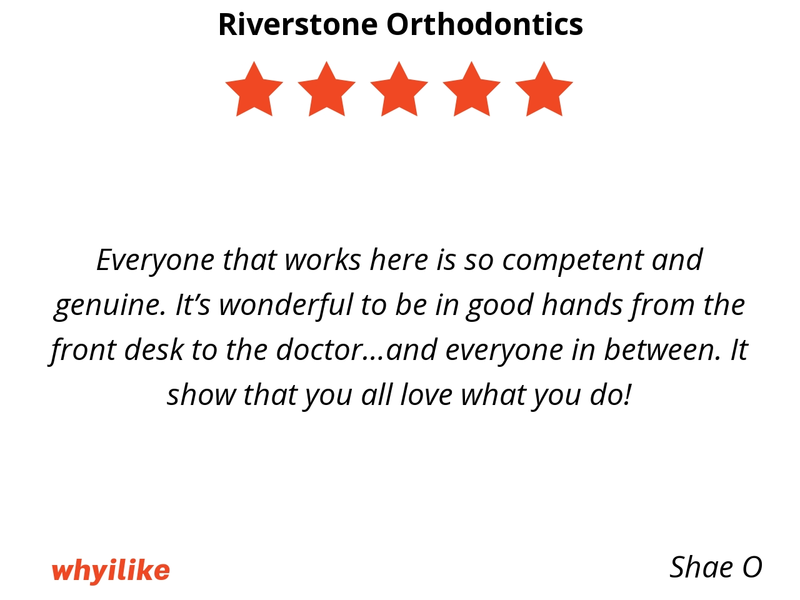 Dr. Chaffee is brilliant, kind, and your staff members always have a smile. I appreciate you immensely! 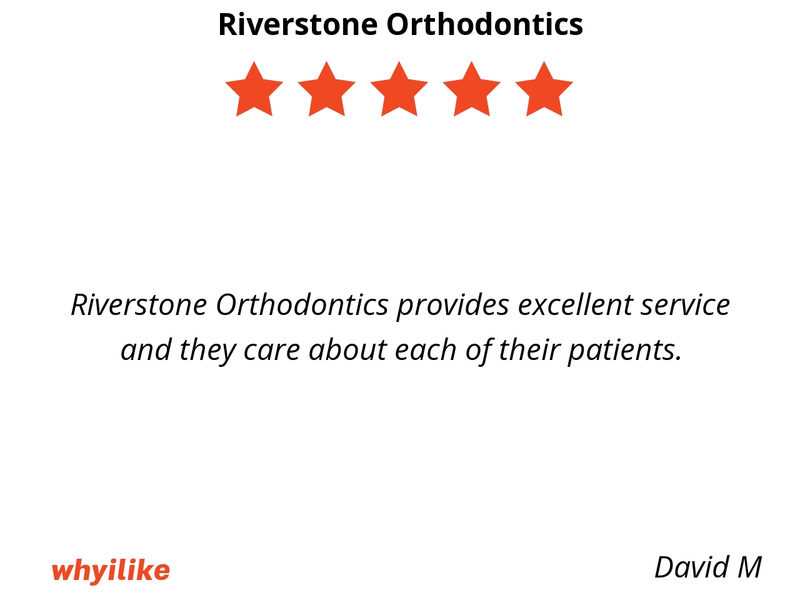 Dr. Chaffee and his staff is very knowledgeable and extremely thorough. Everyone is so friendly and the office is very “High tech” and beautiful. We are on our last child. 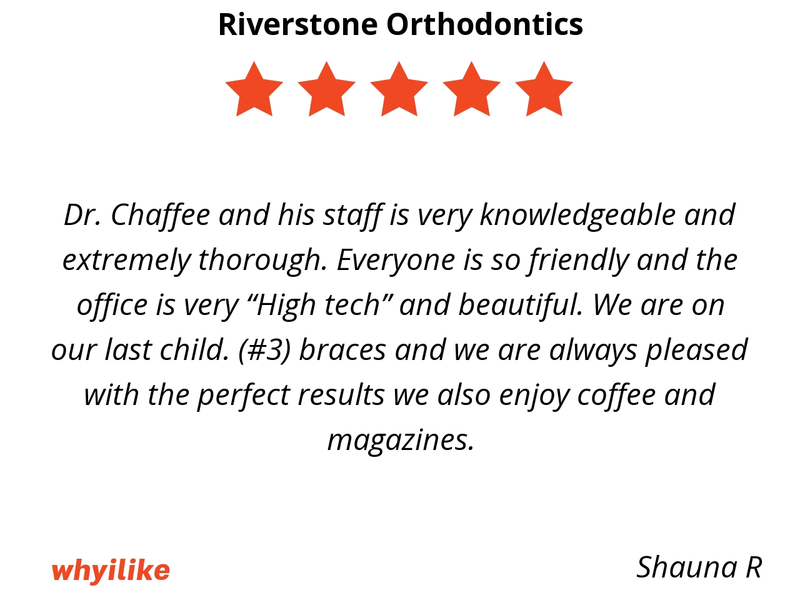 (#3) braces and we are always pleased with the perfect results we also enjoy coffee and magazines. Dr. Chaffee and staff made me feel very well cared for. I can’t believe the results! I am very pleased. Thank, everyone! 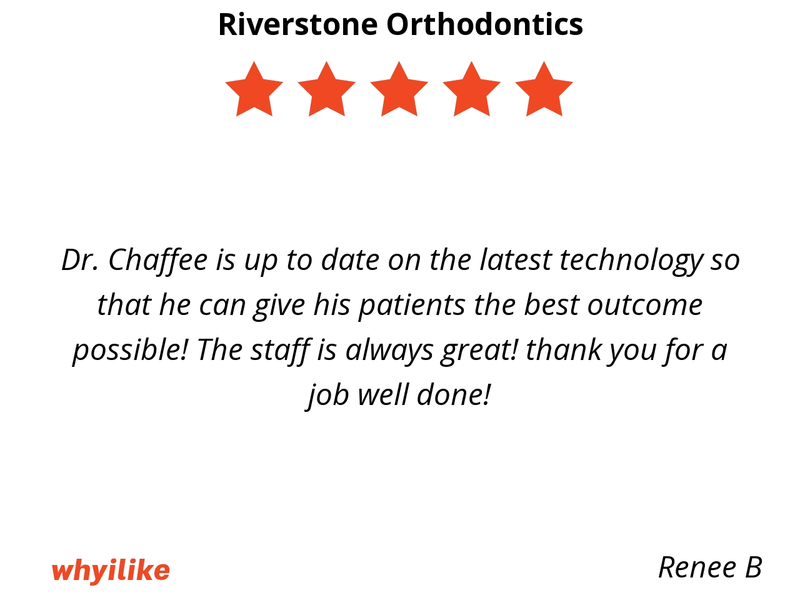 Dr. Chaffee is up to date on the latest technology so that he can give his patients the best outcome possible! The staff is always great! thank you for a job well done! This was our first experience with braces and I did not know what to expect. 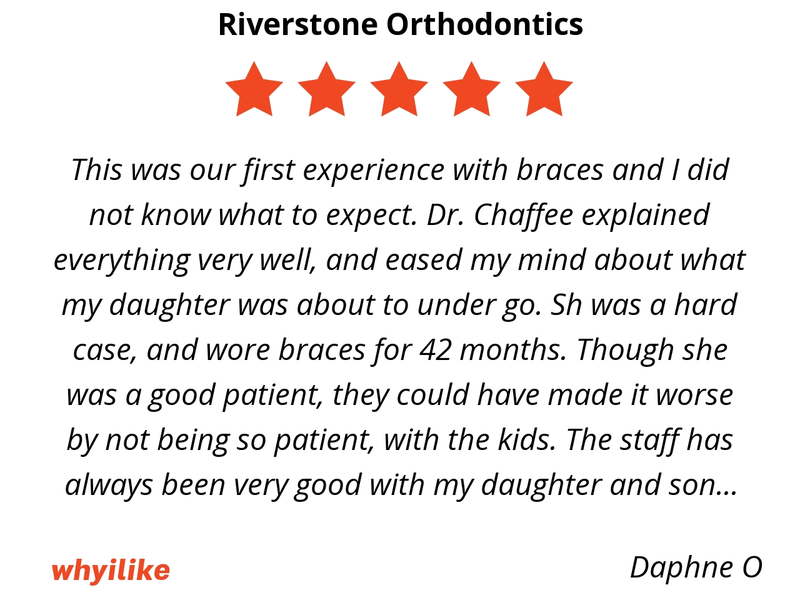 Dr. Chaffee explained everything very well, and eased my mind about what my daughter was about to under go. Sh was a hard case, and wore braces for 42 months. Though she was a good patient, they could have made it worse by not being so patient, with the kids. The staff has always been very good with my daughter and son who is still wearing his. 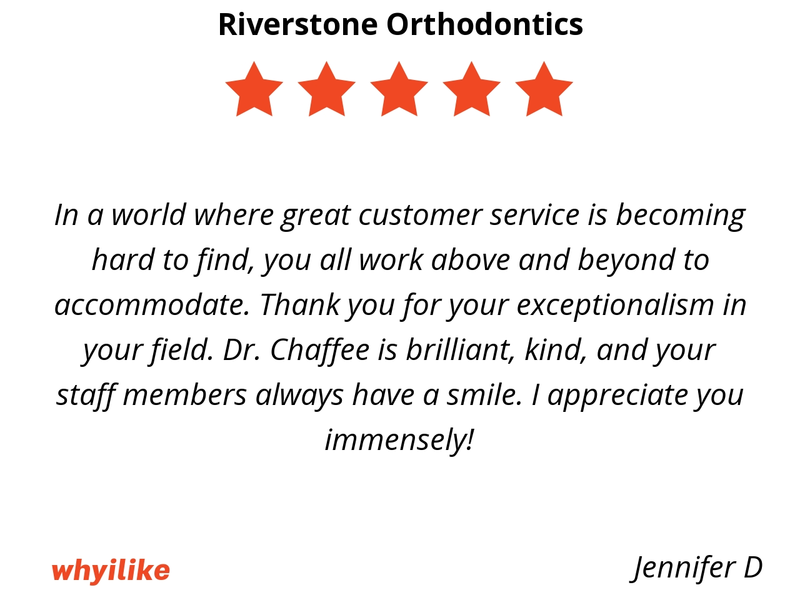 Can’t say enough good things about Dr. Chaffee and his staff. 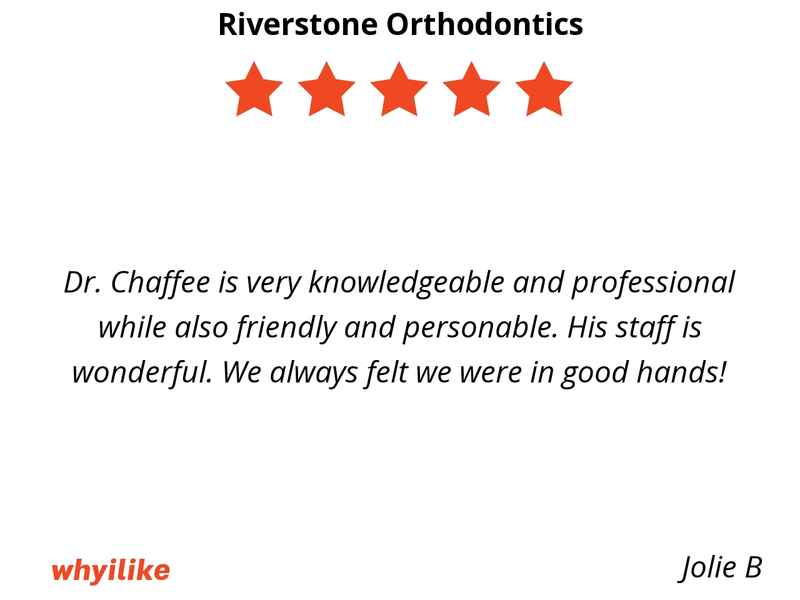 I will definetely refer Dr. Chaffee to anyone i know who is looking for a good orthodontist. Getting my brackets on the first time was fine, but several of them quickly popped off. After that first round though everything went flawlessly and all of the staff were super friendly and dedicated to giving me the best of treatment. 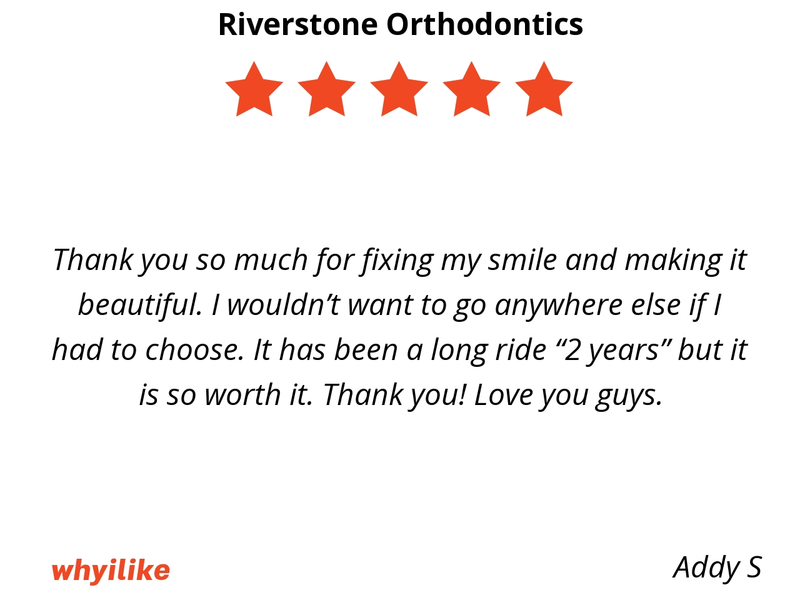 I always recommend people to go to Dr. Chaffee at Riverstone Orthodontics. 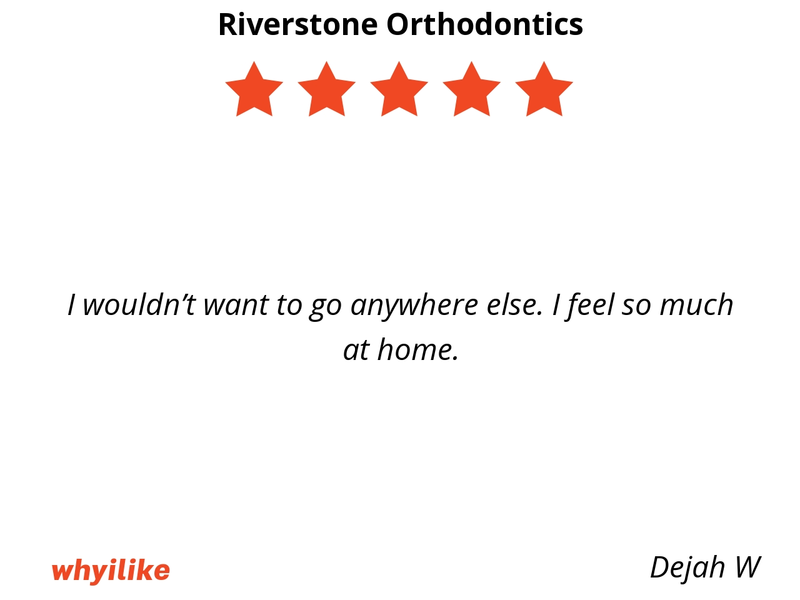 Dr. Chaffee and Riverstone Orthodontics did a wonderful job taking care of my son and his major teeth/jaw problems. 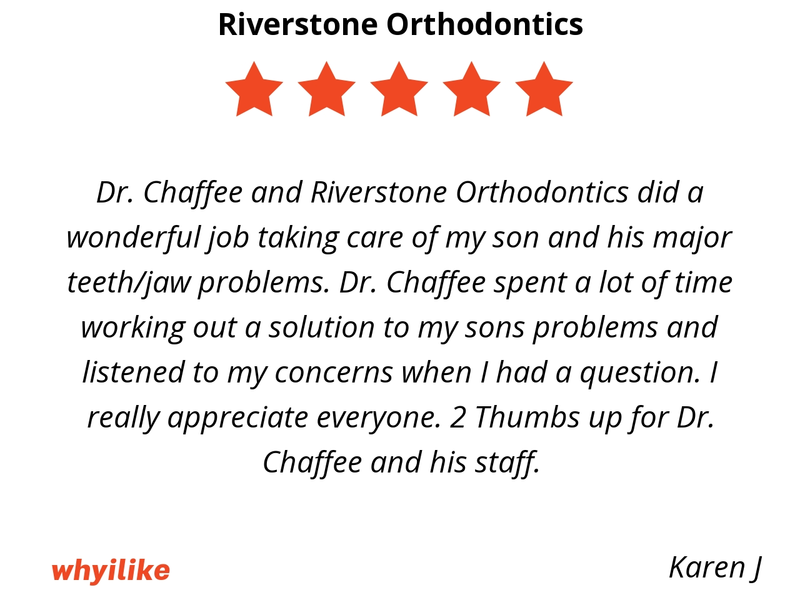 Dr. Chaffee spent a lot of time working out a solution to my sons problems and listened to my concerns when I had a question. I really appreciate everyone. 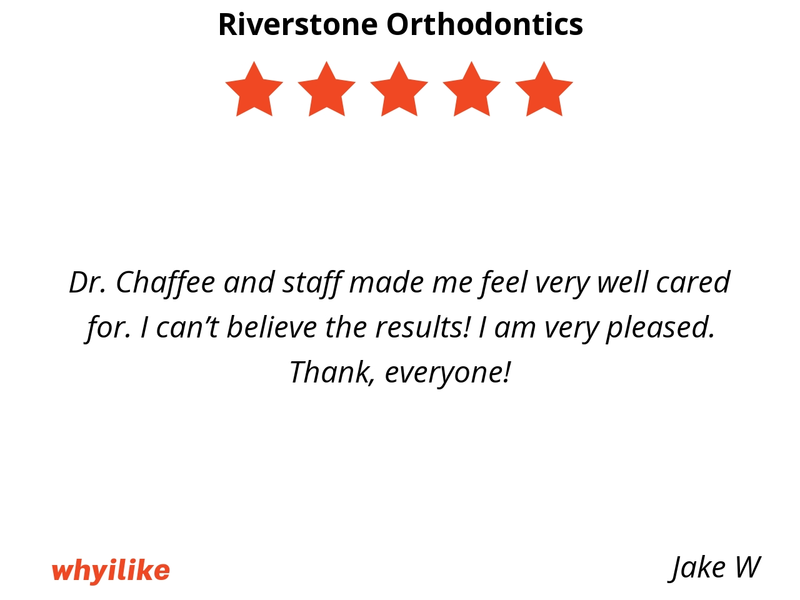 2 Thumbs up for Dr. Chaffee and his staff.